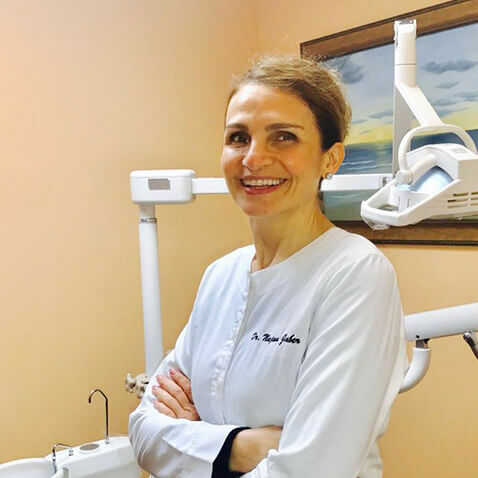 As the sole owner of Smile For Me, Dr. Najwa Jaber is able to reach out to patients in ways not often practiced by conventional dental centers. Taking pride in creating healthy smiles from within, she combines the art of cosmetic dentistry with an array of complimentary services focusing on general and preventive care. She meets her patients’ individual needs through education, guidance, and ongoing support. Six years after earning a Bachelor of Science degree in Electrical Engineering from the New Jersey Institute of Technology, Dr. Jaber returned to school to realize her passion for health. In 1999, she graduated from The New York University College of Dentistry earning the degree of Doctorate of Dental Surgery (DDS). Dr. Najwa Jaber’s multicultural background exposed her at an early age to communities deprived of adequate care and a healthy environment. Fluent in Arabic, English, and French, conversant in Farsi, Spanish, and Wolof (Senegalese dialect), Najwa’s ability to communicate with vast and varied audiences expands her natural sense of compassion across diverse cultures. When not in the office, she enjoys cooking and hosting family and friends, also enjoys walking the boardwalk, swimming, dancing and traveling. Dr. Najwa Jaber is the proud mother of three loving children. Dr. Najwa Jaber also offers her dental services to the non-profit organizations 180 Turning Lives Around and Donated Dental Services. In addition, Dr. Najwa Jaber reaches out to members of her extended community, serving the underprivileged, senior citizens, and many of those who desire a health advocate. Teeth cleaning appointments are some of the most dreaded appointments that people have indicated on their list of fears. Many end up asking is deep cleaning painful? Or does dental teeth cleaning hurt? Yes, it does, but it is all dependent on how well you take care of your teeth. In this article, we have included the best tips to make your next teeth cleaning less painful!